FUoS is going to be presenting a panel at PAX! AAAAHHHHH!!!! Yes, we’ll be going through some of the horrific/hilarious (horrarious!) things that gamers say to each other. We’ll also actually talk like real people for a while and discuss some of the issues with harassment in online gaming. Come laugh with us in person! Laughing at us is also okay. Man, why you gotta be like that. Thanks, DogiojoeXZ. I didn’t quite get it at first, but the sound effects really helped. Super clear now. Our submitter was featured on Xbox Gamer Spotlight and received some nice and not-so-nice comments — as has been the case with several former Spotlighters whose submissions we’ve posted. 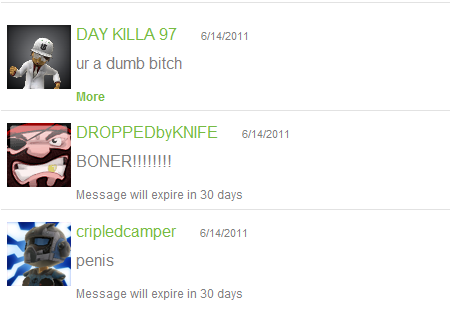 DAY KILLA 97, DROPPEDbyKNIFE and cripledcamper are looking for their brush with fame… in their own twisted way. GroovyLake illustrates why I have such trouble watching ‘uncomfortable’ comedies. What are the social specials today? Mr Staypuft 23 goes down his list of interaction options like they’re discussing which appetizer to share.